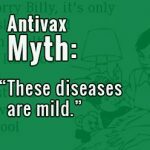 Antivax Myth: “Herd immunity isn't real” - Vaccine F.Y.I. 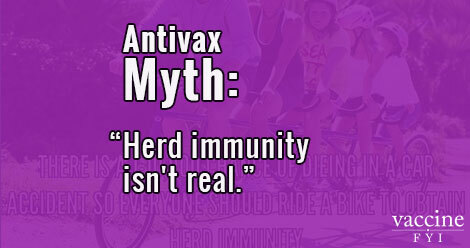 Fact: Herd immunity is real, and functions as a vital part of public health. 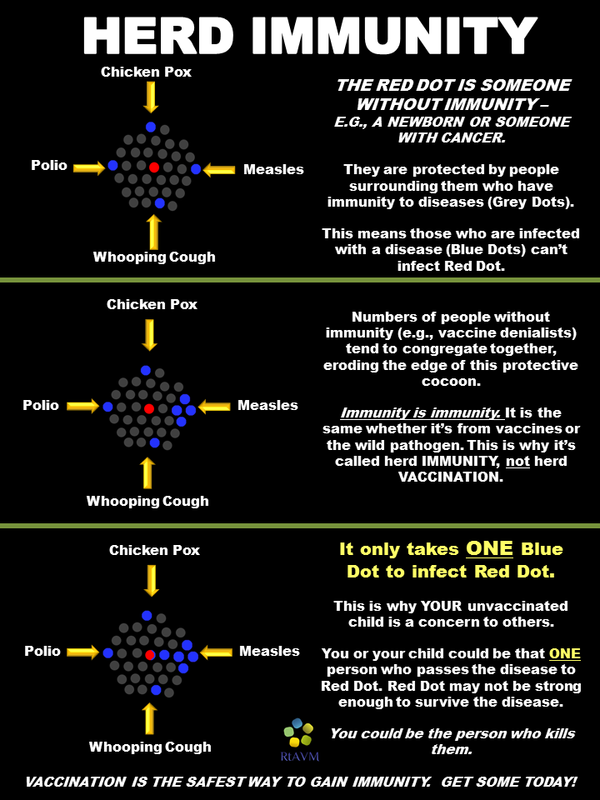 Anti-vaccine activists often claim that herd immunity isn’t a real phenomenon. 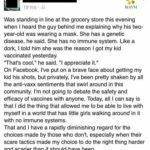 In this way, they deny their responsibility to vaccinate themselves and their children in order to protect others. A few supporting definitions first. A pathogen is a virus or microorganism that causes disease. A host is an organism in which a pathogen lives and grows. Transmission occurs when a pathogen lives in one host, then encounters and infects a suitable second host. 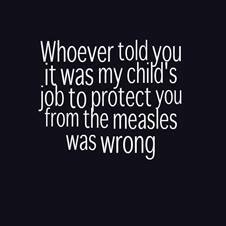 A communicable disease, such as measles or pertussis, is one that is transmissible from an infected individual to an uninfected one. This can occur because of direct contact with the sick person, or with the sick person’s mucus, blood, or other discharge. Sometimes transmission occurs by indirect means, such as touching something that the infected person touched, and then rubbing your eyes or mouth. Immunity is our ability to fight off a particular pathogen before we get sick from it. This resistance is provided by specific antibodies or by white blood cells. 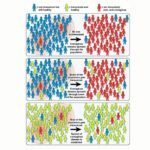 When a large number of people in a population are immune to a communicable disease, typically via vaccination, it reduces transmission of that disease. 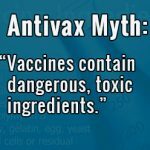 Most vaccines have a very high rate of success in conferring immunity, known as efficacy. 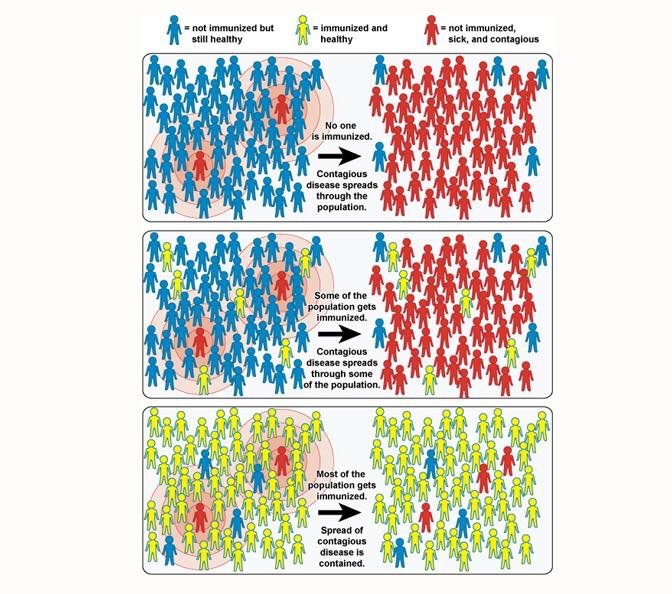 Herd immunity—also known as community immunity—is the ability of the vaccinated population to protect those who are too young or immunocompromised to be vaccinated. 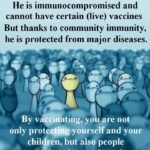 There is usually a threshold percentage for each disease: a degree of vaccine coverage above which the community as a whole is protected. 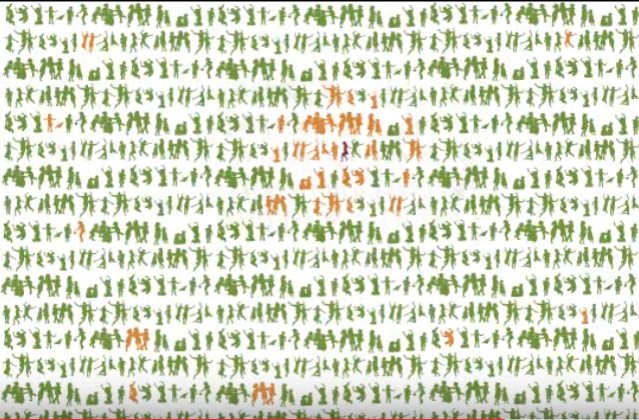 This threshold number is influenced by how infectious a disease is. 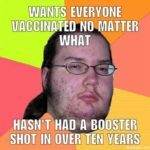 In other words, high vaccine efficacy plus high vaccination rate equals herd immunity. Herd immunity protects at the group level. 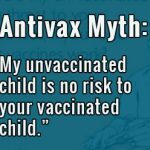 For the best guarantee of protection, each individual who can be vaccinated should be. 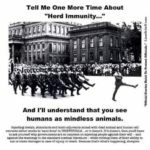 How Do We Know Herd Immunity Is Real? 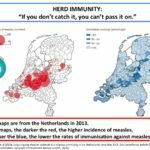 A look at the disease incidence data supports the existence of herd immunity. People who live in areas with lower vaccination rates are more likely to catch vaccine-preventable diseases. On the other hand, areas with very high vaccination rates never (or almost never) see these infections. 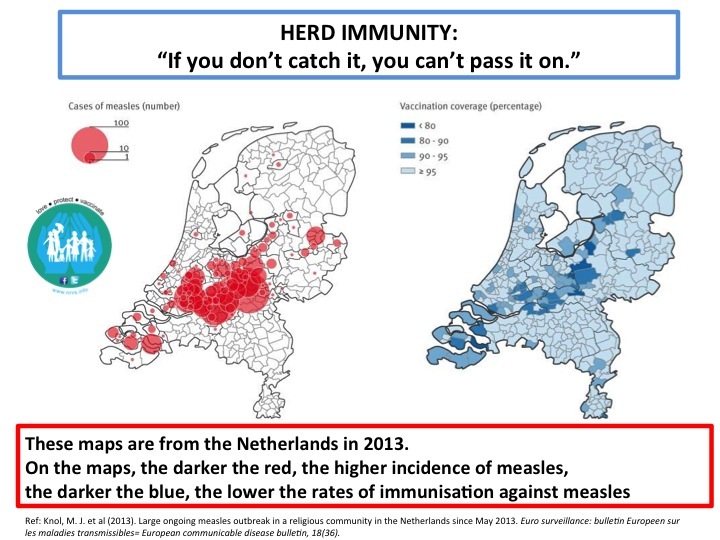 Map of the Netherlands in 2013 showing that areas of lower vaccination rates are correlated with higher incidence of measles. The expansion of vaccination programs for children is having a positive effect even for adults. 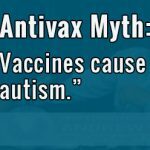 After childhood vaccines were introduced for hepatis A, rotavirus, and pneumococcus, disease incidence plummeted in children. Incidence for these diseases dropped in adults as well. 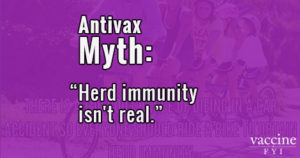 In areas of high vaccination, people who do not vaccinate are protected by herd immunity whether they believe in it or not. Unvaccinated people in the U.S. who travel to an area with low vaccination rates can easily get infected. Then they bring the pathogen back home. 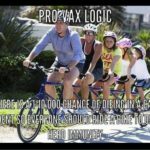 If their home region has an increasing number of unvaccinated people—so much so that herd immunity has broken down—an outbreak can begin. 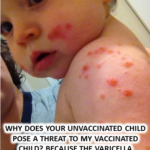 Vaccine coverage is not evenly distributed everywhere. 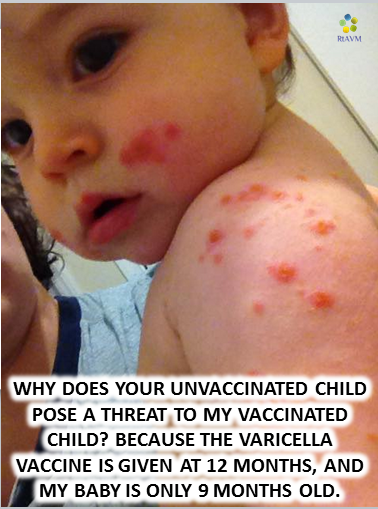 Vaccine resistance frequently occurs in pockets—many people in a geographic area electing to forego immunization. In these regions, communicable diseases can spread like wildfire. 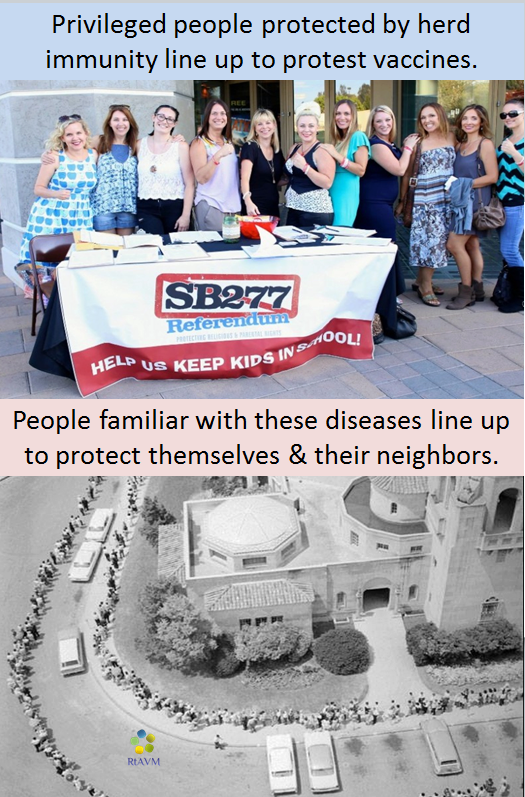 Outbreaks are especially worrisome for those who cannot be vaccinated. 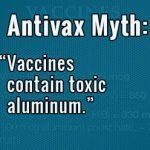 This includes children who are too young to have received the complete series of shots for that pathogen. 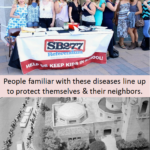 This group also includes the immunocompromised—people who have an impaired immune system. Immunocompromise occurs in cancer and organ transplant patients taking immune-suppressing drugs, people with AIDS, and people who have inherited immune system deficiencies. 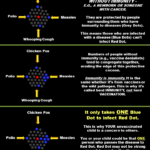 All these unvaccinated or under-vaccinated people need a strong vaccinated population. 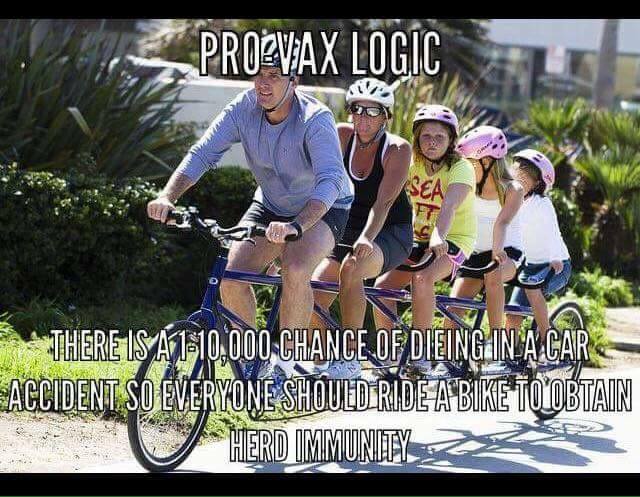 Because no vaccine is 100% effective, even vaccinated people rely on herd immunity to decrease the spread of disease. 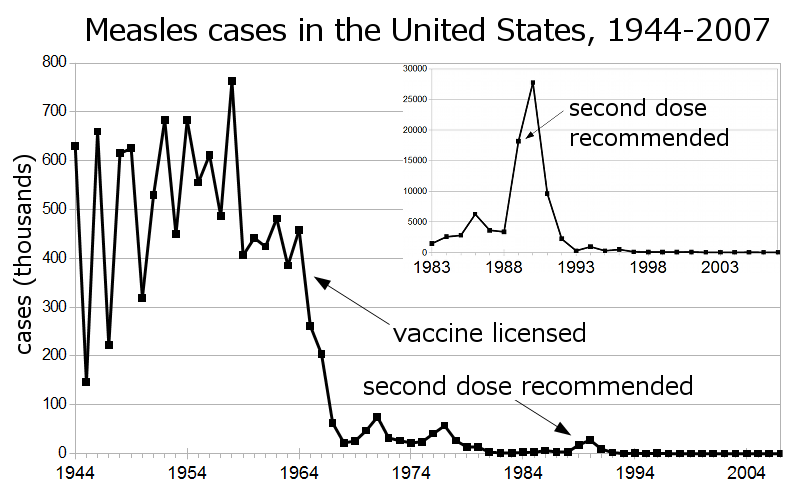 Dr. Bob Sears, author of The Vaccine Book, stated that people who wish not to vaccinate their children may count on herd immunity to protect their children: “I also warn them not to share their fears with their neighbors, because if too many people avoid the MMR, we’ll likely see the diseases increase significantly.” He was right about that one. 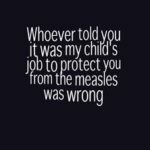 Too many people have avoided the MMR (measles-mumps-rubella) vaccine, and measles has returned to the U.S. after being nearly eradicated. But there are diseases that herd immunity can never protect us from. They do not jump from person to person. 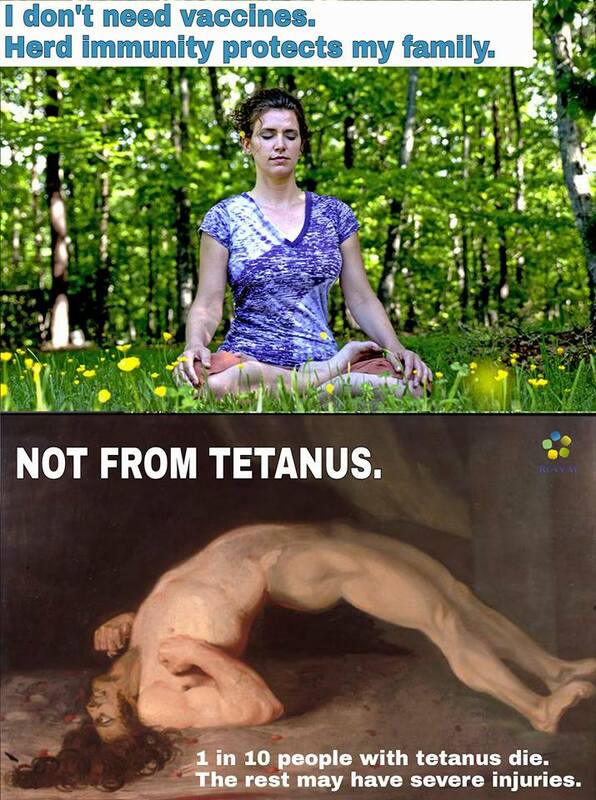 Rather, they are ever-present in the environment. 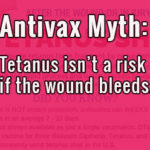 They invade our bodies via a puncture or bite wound. These pathogens include rabies in wild and domesticated animals, and tetanus in soil and feces. 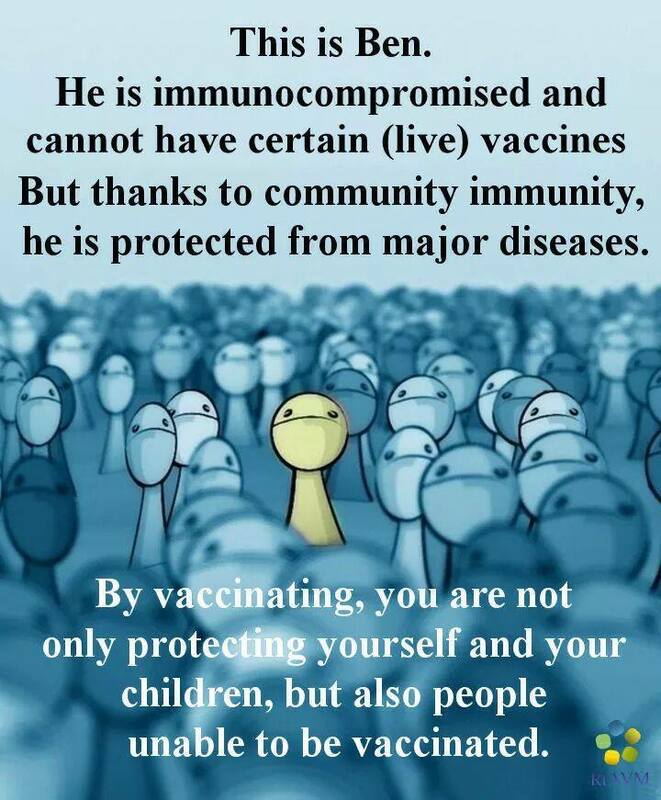 No matter how many people around you are vaccinated, you are not protected from them. 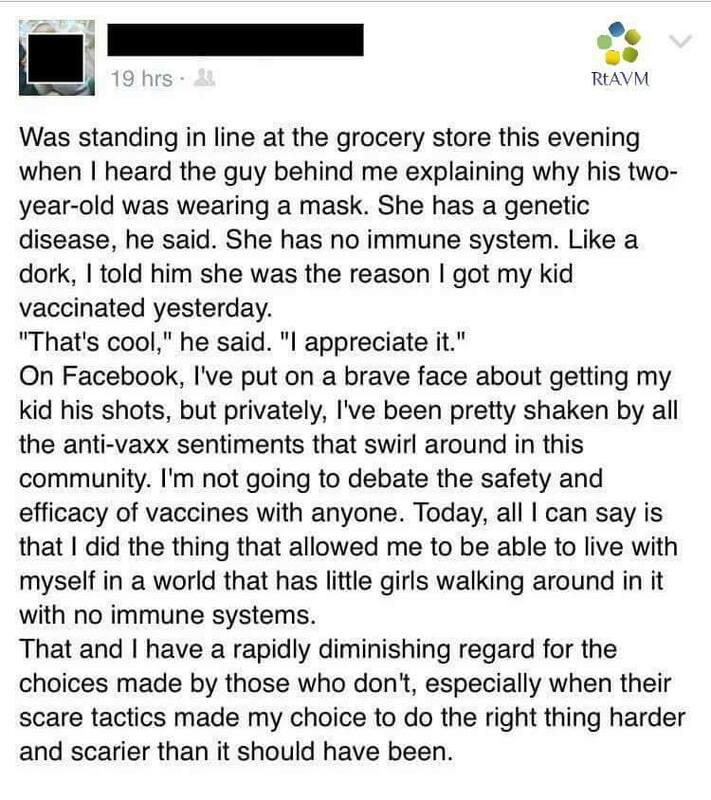 You must be vaccinated yourself to become immune. 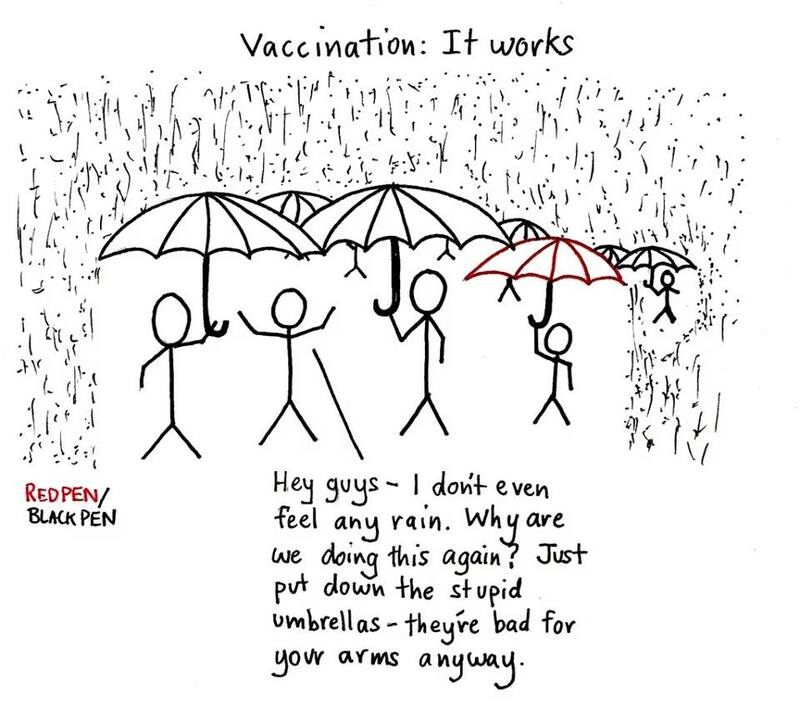 Animation explaining herd immunity (also called ‘community immunity’). 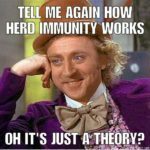 In this video Paul Andersen explains how immune individuals in a population give the entire group a herd immunity. 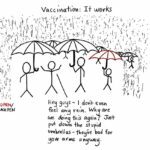 Concepts of immunity, vaccines, basic reproduction number, and herd immunity threshold are discussed.